Microsoft has created an investment fund with the only purpose to help expand the functionality of Kinect beyond its current use as a Xbox 360 peripheral. The program is called Kinect Accelerator and it looks pretty promising. Ubi Interactive, which has worked with Microsoft on this project, created a system that skillfully combines the Kinect function and a classic projector. Together, these 2 elements turn any surface into a touch area. Several versions of the software are available, starting with a basic display screen of 45 inches (price $ 149) and finishing with a larger display of 100 inches (price $ 1,499) that’s most expensive. 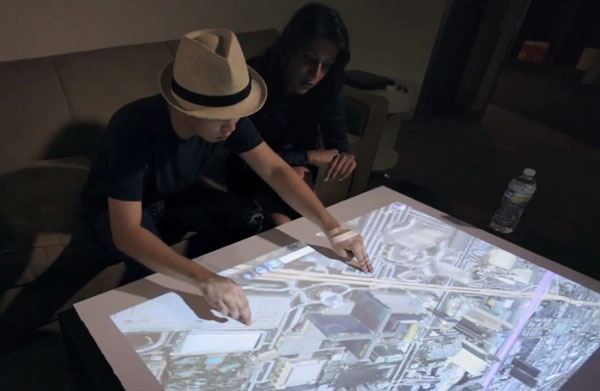 Many companies are equipped with projectors, so all they have to do is buy a Kinect device in order to add some interactivity to the projected presentations. The application runs on Windows 8 environment.